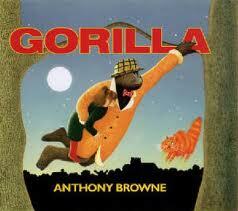 Gorilla is the book that made Anthony Browne’s name. 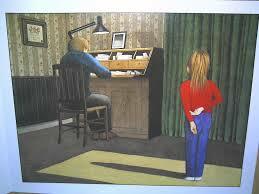 A girl called Hannah — about 6 or 7 years of age — feels that her father doesn’t spend any time with her. She often wants to do something with him but he is always busy. One day her father gifts her a toy gorilla, as she is obsessed with gorillas, seeing gorilla related things everywhere. 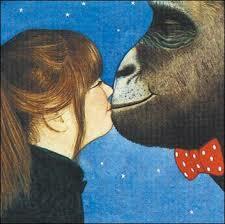 That night Hannah dreams she goes on a dream date with her life-sized gorilla, who is now a stand in father figure. He takes her to the zoo and then to a cafe. 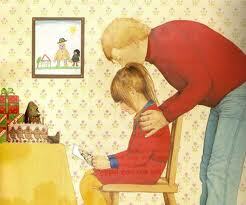 In the morning we learn that it is her birthday, and her father has a surprise — he is going to take her to the zoo. 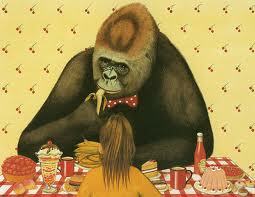 There is something wonderfully unsettling about the picture books of Anthony Browne, who is a postmodern picturebook writer/illustrator. 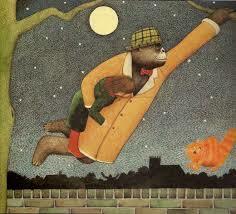 For more on postmodern picture books see David Beagley’s lecture on iTunes U, or my notes on that, here. 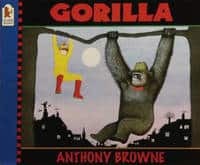 A lesser story would have started with something like, “Tomorrow it was Hannah’s birthday…” It is particularly masterful that Anthony Browne withholds this information until the conclusion. Why? Because the brightness associated with birthdays lightens the ending. Since the first part of the book is melancholic, a birthday tone would not fit well. As is the case in all of Browne’s books, the illustrations contain surreal details which reward the reader for lingering. This is not a page-flipper. A young reader will feel smart, in a Where’s Wally/Spot The Difference kind of way, for picking out what’s strange about each picture. First, Browne sets up a desire in Hannah: She desires to be shown love by her father. 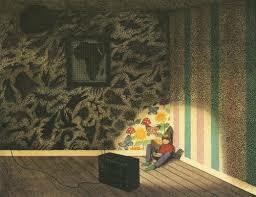 And so the reader must emphasise with Hannah and feel some of her isolation and loneliness. Above, the father holds up a newspaper as a wall. The father has his back to his daughter. Hannah’s isolation is emphasised by the rectangle of light coming through an off-stage door. The rectangle forms a border between Hannah and her father. They may as well be in different worlds. There is no comfort in this house — not even a sofa to sit on, and no carpet, even. Notice the map of Africa on the wall — a part of Hannah’s imagination. The truly masterful part of this illustration is that the light coming out of the television turns the pattern on the wallpaper into butterflies. The light coming out of the television is Hannah’s only company — her only brightness in an otherwise dark home environment. What does it mean when a background merges with the real life of the story? 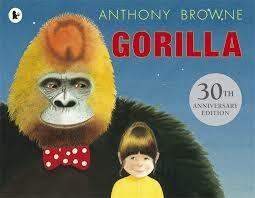 There’s something a little disturbing about this, unless we realise that the gorilla is a fantasy stand-in father. I must admit there are a few scenes that had me arching my eyebrow at what she was up [to] in the way of questionable behavior, but the end explains everything nicely. Superman is the symbol of supreme strength and prowess. This little girl thinks of her father as a superhero. 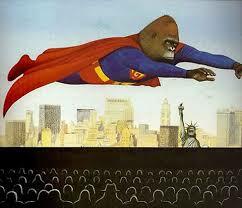 But, like Superman, he is also some glamorous figure who remains out of reach. The city is a jungle and the jungle is a city. Most stories set in cities have elements of the jungle in them, and vice versa. 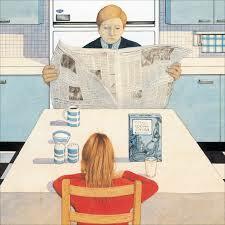 As Kate de Goldi said once on one of the RNZ podcasts, food is immensely important in children’s books. Though there is a bit of a movement towards depicting healthy food in picture books, this is almost impossible to do when the feast takes place inside a child’s imagination, in which case (in the West, at least) it’s almost always cakes and sundaes. The reader (along with Hannah) now learns that Dad really does think about his daughter. He has intuited that Hannah is fascinated with gorillas, and has planned exactly the birthday outing she has been dreaming about. He’s the sort of dad to hang Hannah’s pictures on the wall, framed. The young readers are left with the message that even when they feel that their caregivers don’t care about them, they’ll eventually receive the attention they crave. Of course, terrible caregivers do actually exist in real life. But they don’t tend to populate picture books. Even in the young adult category, truly terrible parents are extremely rare. 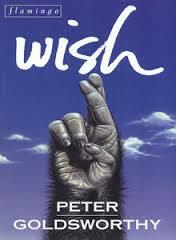 Although very sad at the beginning I found this story to be refreshingly honest and deeply gratifying. This image with the surprised cat is my six-year-0ld’s favourite. The expression on the cat is very funny to a kid, and is perhaps the one bit of true hilarity in the whole book, which is bitter-sweet and melancholic. Perhaps this is why it was chosen as a front cover image. This cover makes readily apparent the jungle/city metaphor. Gotye blends into the wallpaper in Someone That I Used To Know. Flight of the Concords had spoofed this earlier, in their song I Told You I Was Freaky. McGuire, R. (1997). What’s Wrong with This Book? Burningham, J. (1977). Come Away From the Water, Shirley. Child, L. (2002). Who’s Afraid of the Big Bad Book?